1. How to Import iTunes Music to iPhone/iPad/iPod? Step 3. Now, a dialog box will pop up. Just click Music under Media tab on the left side, then select iTunes from the drop-down list and click Music , all music will be desplayed on the main window. You can choose music you'd like to transfer to your iPhone, then click Import. 2. 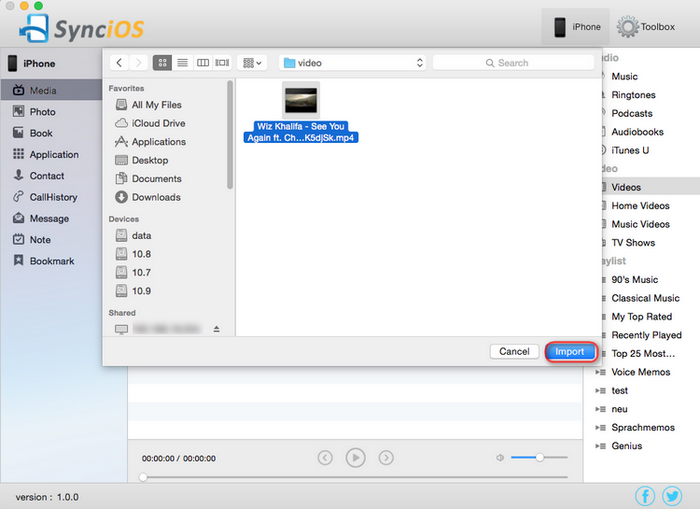 How to Export Music on iPhone/iPod/iPad to Mac? How to extract files from iTunes backup ? Step 1. Click Toolbox > iTunes Backup to start the iTunes Backup Extractor. Note: you do not need to connect your iPhone to Mac. Under Toolbox, click the iTunes Backup icon. If you have synced different iOS devices with iTunes before, there will be more than one backup files displayed. Just choose the one for your iPhone/iPad/iPod. Step 2. Choose data to export to Mac.